Let me introduce you to my new creation. Have you ever wondered how our Spacemen Heroes could travel for almost 40 years through space without getting older or bored to death? Here’s your answer. For forty years our heroes have been playing with LEGO bricks! So, I imagined him, together with all his travelling companions, playing with a LEGO Space base for forty years. Maybe it’s true that playing with LEGO bricks keeps you young. What do you think about it? Do you find it new? Interesting? Creative? I had never seen something like this before and it's one of the reasons I've launched the project on LEGO Ideas. 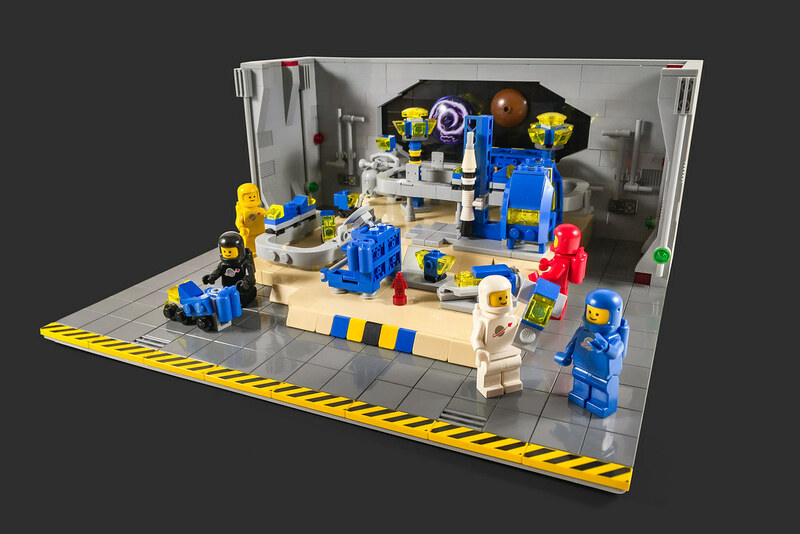 Another one is to see our beloved Classic Space minifig come back, or, why not, maybe even a few themed sets could come back. This project could act as a springboard. If you like, here's the link https://ideas.lego.com/projects/b21ccd00-a013-4509-9614-65cdab72ec82. 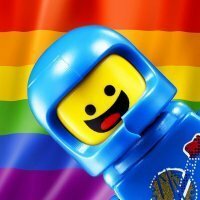 I saw this project on Ideas the other day, and I'll say, its quite a novel homage project for Lego Space's 40th anniversary next year! I love your cosmos backdrop and mini monorail incorporated into this diorama! Good luck on your way to the 10K milestone! However...your image is way too big. The maximum width is 1024 pixels. Since you are using Flickr, this is easy to solve. Can you embed a smaller version (i.e. link to the 1024 version)? Just done. Hope it works fine now. Thank you @Digger of Bricks for the big compliments. Thank you one more time Jim. This is really awesome! So simple miniatures, but they look very convincing - and there is even a monorail! A brilliant and super cute scene. This is really a nice scene. Easily supported, and I hope you make it to 10,000. It would really bridge various generations together as I believe that people of all ages would enjoy this scene for different reasons. If it ever gets made, I might just find a way to incorporate my meteorite collection into it. The microbuilds are great, and I like the imprint of the galaxy on the dish in the background. Excellent job! You have all my support! Awesome little scene! The monorail is the best part of it! Excellent miniatures as well. Will support it for sure! This is an amazing creation ... and front-paging this MOC was a wise decision! Love the use of discs for planets in the background! Looks like the perfect set to add some recolored Saturn V micronauts to. Thank you @Littleworlds for compliments, but if you take a closer look you’ll see that there are two monorails ? Thank you @AFOLguy1970 for those beautiful words. It would bridge various generation together. It’s what LEGO does everyday i think. And it’s awesome, and it’s one of the reasons because I love LEGO. Excuse me if my English is not perfect, i’m doing my best. I hope in 10000 supporters too ? Thank you so much @sdrnet. Big friend ? So clever ! I will support your project too ! Thank you @GeoBrick. I had the same idea, but I had only one in dark red. But they will be perfect. Supported. This could be the perfect set for a 40th anniversary! Also, would make a brilliant parts set, which would help sales also. It has humor and that is a nice addition. Great use of parts in the mini models. I love classic space (hint hint: my avatar). 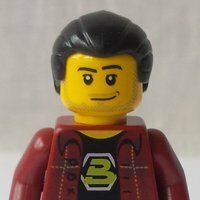 Time to find your submission to Lego Ideas and you'll get another vote.